Now that I am spending any available free time considering designs for a completely unattainable 5 piece setting of porcelain tableware, I have had to outsource my custom van theme research and development. Clearly the sweetest plum of owning a small business is the coloring contest - that's the money melon! 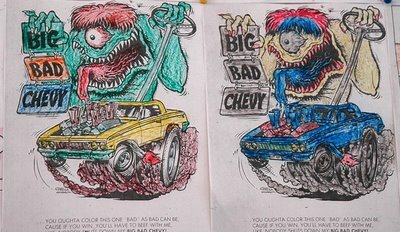 Mr. Coop kindly scanned about 20 pages from a circa 1972 Ed Roth coloring book and the kids took it from there.